A wine cellar refrigeration system is a crucial component of cellaring wines. The cooling unit is responsible for keeping temperature levels between 50°F and 55°F, and the relative humidity at around 60%. Maintaining a stable and consistent storage environment is essential to preserving and improving the quality of wines for a prolonged period of time. Wine cellar climate control systems are used in both residential wine rooms and commercial wine displays. 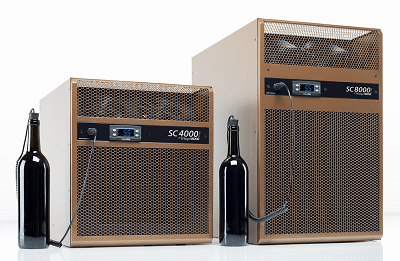 There are three different types of residential and commercial wine cellar cooling units on the market: self-contained “through the wall” systems, split cooling systems, and self-contained ducted units. Each refrigeration unit has unique specifications, and requires regular preventative maintenance and service from licensed HVAC personnel. A self-contained “through the wall” wine cellar cooling unit is the most economical and the easiest to install. It is simply mounted on the wall, and vents through an adjacent room. The room must be well-ventilated and should not exceed 80°F. A split wine cellar cooling system houses the evaporator unit and condensing unit separately. Separating the units provides flexibility in wine cellar cooling installation options, that can help minimize the impact of noise, heat, and vibration. A line set is used to connect the condensing unit (placed in a remote location) to the evaporator unit (installed inside the wine room). A self-contained ducted cooling unit provides efficient performance. This entire cooling unit can be located within or near the wine cellar (e.g. attic, adjoining room, etc.). Air ducts are used to supply cold air into the wine room, and return air vents pump air out of the cellar and into the system. Since the unit can be installed outside the wine cellar, the absence of mechanical equipment inside the storage space can increase total bottle capacity, as well as add to the aesthetics. The absence or lack of wine cellar cooling installation can cause irreversible damage to a wine collection. Proper support infrastructure (e.g. insulation and a vapor barrier) must also be in place to ensure that the ideal climate conditions are maintained and the refrigeration system does not overexert itself, which could otherwise lead to overheating and costly damage. Applying insulation to all walls and the ceiling helps maintain a consistent wine storage temperature. The cool environment of a wine cellar can promote moisture migration, which can consequently lead to mold growth. A properly installed vapor barrier prevents vapor diffusion and halts mold presence inside the wine room. Routine wine cellar cooling maintenance and annual inspection service is highly recommended to ensure the optimum performance of climate control systems. Proper service and maintenance conducted by a certified HVAC professional will keep the refrigeration equipment running smoothly and prevent higher cost repairs down the line. An HVAC professional is a licensed technician that specializes in the maintenance, repair, and installation of various equipment, including commercial and residential wine cellar cooling systems, air conditioning, refrigeration, humidifiers, heating units, hermetic compressors, and intake and exhaust fans. Preventative wine cellar cooling maintenance Los Angeles allows HVAC professionals to identify a potential problem that may lead to a major breakdown of a residential or commercial wine cellar cooling system. Sudden failure of wine cellar climate control systems exposes wines to temperature swings that can completely ruin the overall taste and flavor of wines. A preventative maintenance plan for commercial or residential wine cellar cooling systems provides early detection of mechanical failure. Regular wine cellar cooling maintenance and inspection service enables a licensed HVAC professional to formulate and implement corrective measures and actions that can greatly reduce the probability of equipment malfunction and complete system breakdown. HVAC preventative wine cellar cooling maintenance checklist includes monitoring and adjusting refrigerant levels, operation of compressor, fan motors, amperage and voltage readings, superheat and sub-cooling measurements, as well as checking electronic relays and controls, and wiring connection. Routine inspection service of wine cellar cooling installation helps maintain the efficiency of the refrigeration equipment. 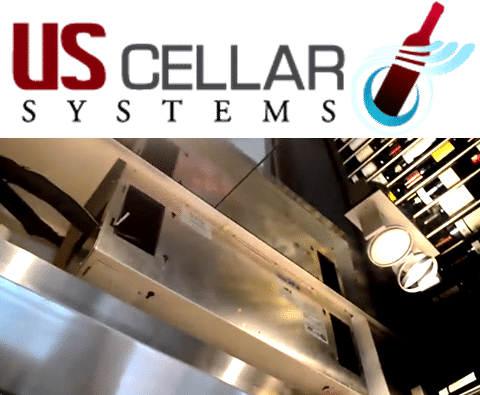 M&M Cellar Systems offer a proactive wine cellar cooling maintenance Los Angeles plan that allows their team of technicians to conduct periodic health checks to commercial or residential wine cellar cooling systems. A general inspection of the cooling system keeps the equipment running smoothly at all times, and minimizes the risk of exposing wine collections to unfavorable climate conditions. 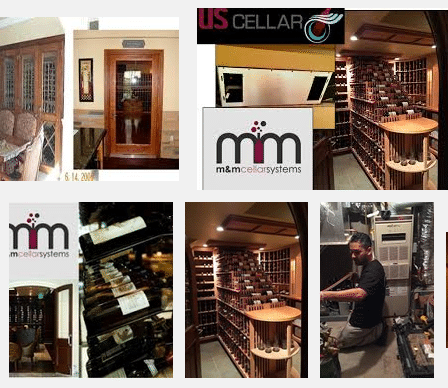 M&M Cellar Systems is a Los Angeles based company that specializes in the design and installation of residential and commercial wine cellar cooling systems. The company offers top notch wine cellar refrigeration equipment product sales that are backed by a team of specialists that provide quality wine cellar cooling maintenance Los Angeles services. The refrigeration solutions they supply are from the best manufacturers in the industry: US Cellar Systems, CellarPro, Wine Guardian, and WhisperKOOL.